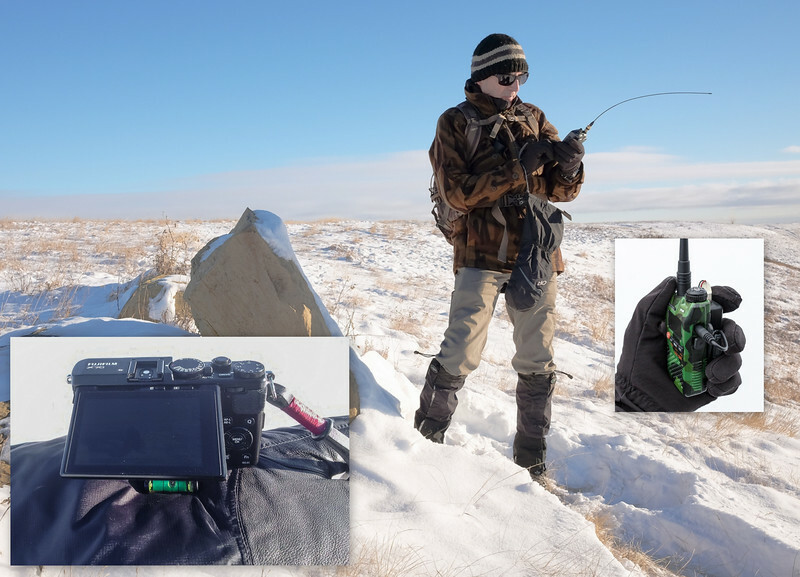 With the temperature hovering in the -20 C range while I was out on a hike for several hours on this day, I still took the time to play radio as seen in the above photo. My mobile parked at the trailhead was hearing and digipeating the beacons from my D72 and the UV-3R/T3- Micro (insert photo), up to the APRS Network, keeping me connected on this day. I continue to run tests with my UV-3R/T3-Micro as to its capability, that is giving me more insight as to the plan I have in mind with placing an APRS device in my RC sailplane, a project that may also include an onboard Wi-Fi camera as well. Leaving my mobile at the trailhead, I had the necessities that I felt I needed to make for a pleasant hike along the ridges overlooking the river valley bordering the Bow River 35 kilometers southeast of Calgary, all the while continuing with the tests that were on-going with the radio gear I had with me. On this day, I left behind my normal carry of (heavy) camera equipment, although you will never find me without a camera ( no, my cellphone doesn't count ) when I'm out and about. So on this day I had my very capable APS-C sensor equipped pocket camera along that has a fixed 28mm lens (film camera equivalent), meaning you zoom by moving closer! The insert photo shows the camera sitting on one of my mitts in the snow, with the self-timer set allowing me time to step in to this photo before the camera fires. What I wanted to point out, is the fact that the camera is sitting level to the world at large, based on the fact the bubble level screwed to the bottom of the camera confirms this. As I've said before, there's nothing that I hate worse that photos with the horizon tilting one way or another. Bubble levels are very in-expensive to purchase, and although thie one pictured here is actually part of a small detachable ballhead that attaches to a lightweight monopod, also with me on this day (in the pack), you can actually purchase a bubble level that slides in to the hot-shoe located on the top of the camera. If your camera doesn't have a hot-shoe, just sit the bubble level on top of the camera, that works. BTY, one other thing that this camera does, and when your traveling light (no tripod) the fact that this camera has a tilting rear LCD is a wonderful option in situations such as this one, where the camera is sitting at ground (snow) level. The LCD on the X70 pivots through a range of motions of 180 degrees, allowing for easy framing of the photo. On another note, you may have noticed that I am wearing gloves, but yet I have one of my mitts dangling from my wrist, the other mitt under my camera used to support and keep the camera out of the snow. With the temperature hovering around -20 C, and although a good pair of gloves or a pair of mittens are more than adequate to keep my hands warm under normal circumstances, and because I am carrying a camera as well as several handheld radios, as well as a Kestrel 3500 portable weather device with me, I need to be able to manipulate the controls of these devices without being encumbered by clumsy gloves or mittens. A long time ago, and in particular with being out in the elements while involved in photography, I came up with a working solution to keep my hands reasonably warm while shooting photos with my cameras. What works very well is a thin pair of gloves that fit my hands like a second skin, and yet allow my gloved hands to slip nicely into my mountaineering OR mittens seen in the photo. When shooting photos, I drop one or both mittens that are lanyarded to my wrists, and it may even be only my shooting hand used for working the shutter of my DSLR or the shutter of my pocket camera on this day. With the thin gloves on my hands that allow me to work the various controls without difficulty, and if my hands start to get cold, back in to the mittens they go. Over the years, this has proven to work well for me, and there are other winter activities that I may be involved in where this combination of inner glove and mitt work well together for different reasons. On this day, I kept switching between my X70 and my Kenwood D72, and my UV-3R/T3 Micro, all three requiring the dexterity of fingers to work the controls of any one of the three, yet my hands and fingers were never allowed to soak up the cold with this combo of glove and mitt keeping my hands warm. On a final note, of course it goes without saying that your hands will be warmer in a pair of mittens than in a pair of comparable gloves, as your fingers work together to stay warm in mittens, whereas they don't stay as warm when in gloves with the fingers isolated from one another.